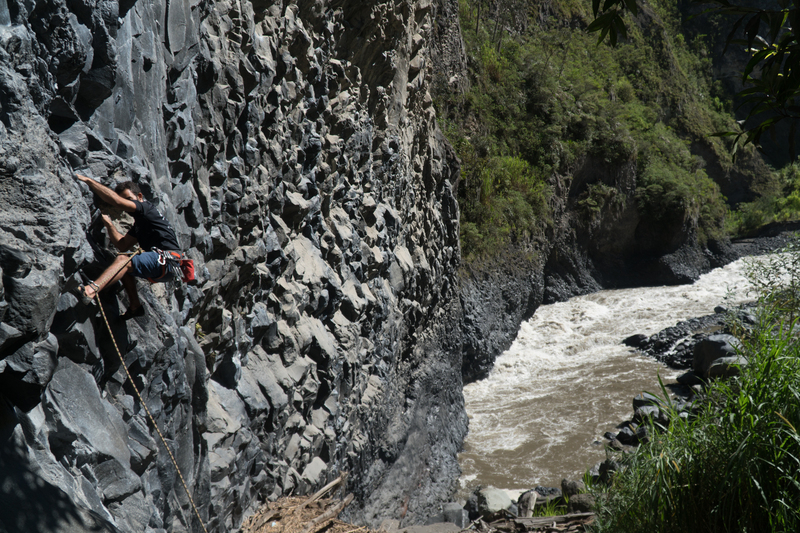 Just a short bus or cab ride from the town of Baños you can go rock climbing on a volcanic rock wall overlooking the river. And the views are just breath-taking. 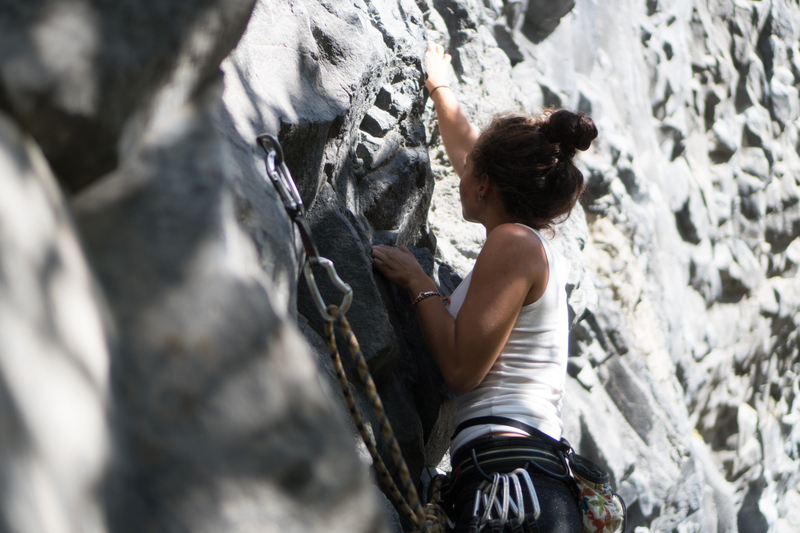 Rock climbing is a sport of setting goals and achieving them. Whether it takes 1 try or 100, you always have to challenge yourself. But the result is truly rewarding. When you reach the top and reflect on all you have done to get to your view from on top of the world. You really earned it. To get to the climbing spot you can either catch a bus from Mayra’s place for 30 cents or take a cab ride for $1.50 to San Martin. Once there you pay $2 to enter the park, if you have your own equipment you are ready to go if not you can rent it once you reach there. You can also get a guide + gear + transport in Banos. You walk down to the wall and there are usually other climbers there as well. Speaking from personal experience climbing here in Ecuador is just amazing. I experienced volcanic rock for the first time and even though it’s a bit slippery, the rock formations are incredible. I love it and if you ever visit Ecuador, I highly recommend it! The level of the routes range from beginners to the most experience and they even have multi-pitch climbing but unfortunately I didn’t get the chance to try. In the previous post I told you a little bit about my adventures during my year away. But, before all the adventures started, I wanted to learn Spanish. As I did not speak any Spanish, it would definitely be convenient traveling by myself as a woman and of course because I would like to communicate with locals I meet during my travels. At the beginning I was really nervous to learn a new language. I had just graduated so I was done with school and learning and then it all started again. But let me tell you, it was the best thing I did. Not going to lie, the first week was really hard. Once I arrived, I immediately started Spanish classes and stayed with a homestay family. It was a lot of Spanish at once! But the first week passed and it got really fun. Learning a new language, learning about a new culture and being able to talk to people in their language (I could not do that within one week) opens new doors. I studied for 5 weeks, and at that point I felt confident enough to start traveling and speaking Spanish. At the beginning it was hard to talk in Spanish, all the information I’d learned needed to be processed. But after being immersed in the language I learned even more. 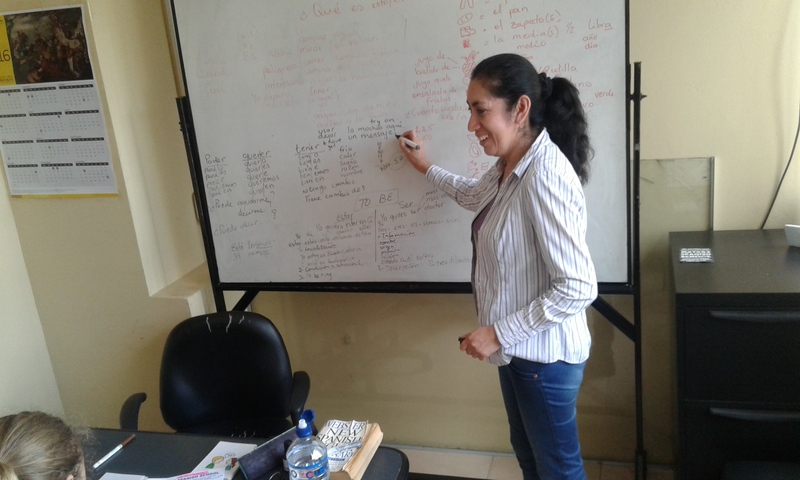 Now, almost at the end of my travels, I’m back taking Spanish classes. Mostly because I want to continue learning and because I enjoy speaking and practicing Spanish and understanding it. Be inspired and get out of the comfort zone. Learn a new language and enjoy your travels to the fullest!